His first few years in ISKCON he spent distributing Srila Prabhupada’s books in USA as a brahmacari – first as a member of Radha Damodara TSKP and then in BBT Library Party. In 1976 he traveled to India, visiting the holy places and preaching the glories of Lord Krishna. A year later he based himself in Germany, from where he later expanded his preaching to East – European countries and Scandinavia. At 1982 he took to the sannyasa asram and up to the year 1987 continued teaching Krsna Consciousness in Europe. He traveled throughout the world from 1988 till 1991, visiting many Asian and Australasian countries. At this time he became a member of ISKCON’s Governing Body Commission for next 11 years. His area of responsibility was Norway, Finland, Benelux, Poland, Czech Republic, Slovakia, Romania, Bulgaria and Greece. At 1996 he was elected as the GBC-chairman. He preached extensively in these countries by giving lectures and supervising the development of ISKCON movement there. Well-known for his deep understanding of the philosophy of Krsna consciousness, he ran an electronic Q&A conference on COM (“Danda”). From mid 90’s he started to write books: Substance and Shadow: The Vedic Method of Knowledge (1996), Transcendental Personalism – Vedic Answers for the Human Situation (1997) and Dimensions of Good & Evil (1999). He also authored many smaller texts and essays. His last book Vedanta Psychology (2007) was published just few weeks before his departure. From 2001 he started to spend more time in India. Till 2005 he continued his preaching in the above mentioned European countries. Since March 2003 he is a member of Shastric Advisory Council (SAC). The SAC was formed in 2002 to assist the GBC in answering philosophical challenges. From 2001 he started to spend more time in India, mainly because of his problems with depressions. From the same reason he stopped accepting new disciples. At this time he started to worship his personal salagram-silas (Sri Sri Jagannath – Sudarsan), to Whom he was doing daily puja and homa everywhere on his travels. Since March 2003 he was a member of Shastric Advisory Council (SAC). The SAC was formed in 2002 to assist the GBC in answering philosophical challenges. From 2003 to 2005 he was almost daily publishing his internet Journal In2-MeC. Till 2005 he continued his preaching in the above mentioned European countries. 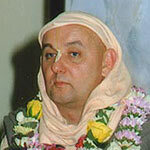 In March 2005 he made major changes in his position within ISKCON. Being a faithful follower of Srila Prabhupada, he moved to the holy Sri Mayapur Dham, where he fully engaged himself under the shelter of Bhaktivedanta Academy in writing Srimad Bhagavatam study guides and lecturing together with his dear godbrother and friend Bhaktividya Purna Maharaja. He has left this mortal world in April 2007 in Sri Mayapur Dham. His departure is a great loss for the whole vaisnava community. His achievements in terms of management, book distribution, lecturing, preaching and literary activities prove his great love for Srila Prabhupada. Very few people remained untouched by his extatic kirtans and Stay High Forever sessions. So many people are indebted to him for bringing them in touch with Krsna consciousness. To many devotees he gave valuable instructions on how to make further advancement in spiritual life. He lived to help others, which sometimes caused him difficulties. He taught by his example how to be always a surrendered servant of one’s spiritual master and Krsna. Let’s pray to Suhotra Maharaja to bestow his mercy on us, so that we can one day also achieve this realm from which one does not come back. Our website is a humble attempt to serve this purpose.